Rinse and pat dry the pork tenderloin. Combine the salt, pepper, and cumin, then rub over the pork tenderloin. Heat the canola oil in a large, high-sided skillet over medium-high heat. Add the pork tenderloin and sear each side, around 1-2 minutes per side. Reduce heat to medium, then squeeze the orange juice over the pork tenderloin, cover with the chopped onion, serranos, and orange peel, then cover and let cook for 20 minutes, or until a meat thermometer inserted into the thickest portion reads 145 degrees. Remove from the pan and let sit for five minute, then shred with two forks. Heat a comal over medium-high heat. Divide the pulled pork between the 10 tortillas, sprinkle with Monterey Jack cheese, fold into a taco shape and cook for around 2 minutes per quesadilla, flipping halfway through, until cheese is bubbly and tortillas are golden brown. 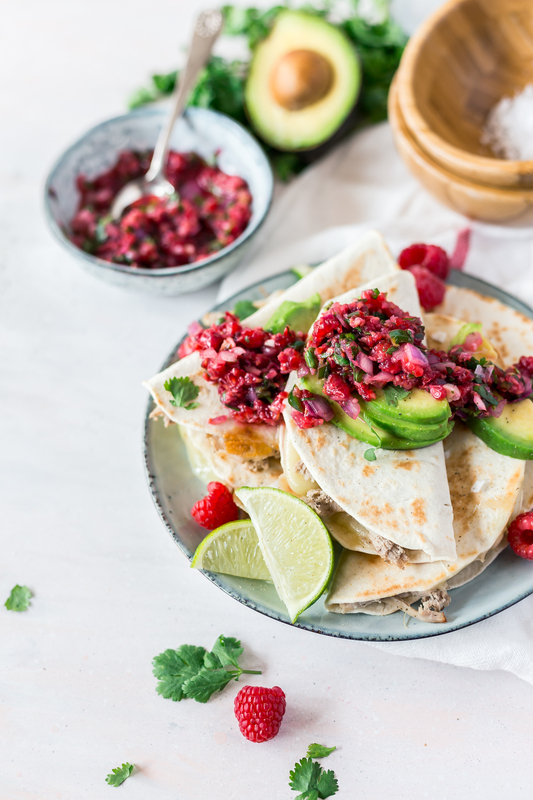 In a small bowl, combine the chopped raspberries, red onion, cilantro, and serrano pepper. Add the lime juice, then sprinkle with salt and pepper. Stir gently to combine, adjust seasoning if needed, and serve with the hot quesadilla tacos.